Owais A. Dagra is a self made entrepreneur with over 30 years experience in ventures within Pakistan and the United States ranging from engineering, retail, construction, real estate, marine services, wholesale distribution and manufacturing. Today, he is the Founder & Chairman of Stallion Textiles, one of the largest textile-spinning mills in the world comprising of 156,000 spindles, located in Pakistan. Owais Dagra practices a detail oriented hands-on operational philosophy with a hybrid management system of entrepreneurial decision-making. Reflecting on experiences in life and business, Owais has always focused on extracting lessons, which have formulated into a set of fundamental guiding principals over the years. He has referred to this approach as “The University of Life” believing that one can steer themselves towards success in all dimensions of life, regardless of their circumstances. Owais Dagra has developed “The Dagra Model“ which focuses on optimizing all facets of a business. Stallion Textiles embodies this approach. This proven model finds incremental opportunities in existing business sectors to optimize operational and business processes yielding greater efficiencies, increased output and improved product quality/value. Owais Dagra’s approach towards business grew out of the necessity of his circumstances. His past business ventures have experienced meteoric rise and even served to position him in June of 1998 as the recipient of the prestigious Virginia Retail Entrepreneur of The Year award; founded by Ernst & Young. 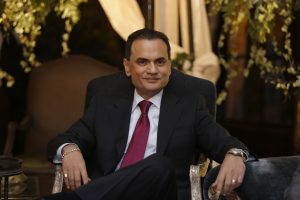 Today, he is an active member and well-respected figure in the Pakistani business community.